The world acclaimed game viewing of Savute Safari Lodge is an experience not to be missed. Savute Safari Lodge is located on the scenic banks of the Stolen River, Botswana. This river forms part of the Savute channel and is home to a large concentration of Lion and Elephant. Sit back and relax while watching African wildlife quench their thirst at the waterhole. Stay in luxury at this Botswana game lodge in elegantly furnished chalets. The glass and timber chalets are decorated in fresh colours while the thatched roofs keep them cool. Each chalet features its own en-suie bathroom. 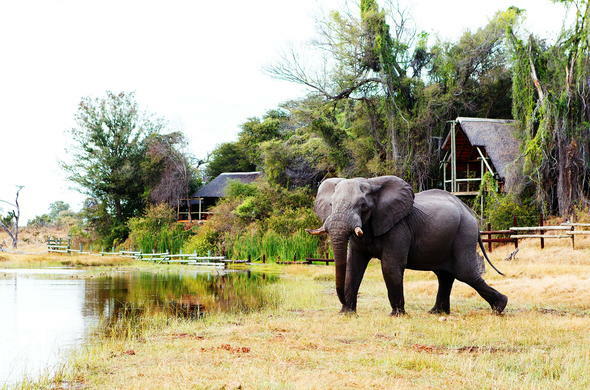 Look forward to excellent game viewing opportunities while staying at this Botswana game lodge. During the summer, herds of Zebra migrate to the area in search of nutritious grass. Look forward to exciting 4x4 game drives or visit the ancient San rock paintings at Gubatsa Hills. Children under 6 are required to to be booked for private activities at an additional cost. This may be subject to the discretion of the managers or guides. Children under 15 must share accommodation with a parent. Children are not allowed to share in the Exclusive Suites. Your professional guide will unveil the secrets of the African bush on game drives in open 4X4 safari vehicles. Savute is famous for the frequently observed interaction between Africa's major predators.